80 years ago, the word Fitzrovia was yet to be coined. 70 years ago, nobody talked about the 'South Bank'. 50 years ago, Chinatown would conjure images of Limehouse. 40 years ago, Canary Wharf was little-known outside the docks. 10 years ago, nobody said 'Midtown'. Today, nobody says Midtown. Nothing is eternal in a city like London, and that includes the place names. New Cross was once known as Hatcham. The village of Garratt, famous for its mock mayoral elections, long ago vanished into the sprawl of Wandsworth. In recent years, the pace of change, or proposed change, has accelerated. Neighbourhoods right across the capital are looking for pseudonyms, as property developers, business improvement districts (BIDs) and the occasional cultural or residents' group seek swankier names to attract attention. The most egregious example is Midtown, coined a half decade ago by the local BID to encapsulate the traditional areas of Holborn, Bloomsbury and St Giles. Many more examples are competing for recognition, from Tyburnia to London's Luxury Quarter. Some areas are pluripotent with possibilities. Londonist's office, for example, might be located in Tech City, the Silicon Roundabout, SoSho or Hoxditch. Or maybe just plain Old Street. We've started ↓ this here map ↓ to keep track of this dizzying range of rebrandings. It shows name changes and coinages since the year 2000. We've left off older examples, such as Broadgate and Banglatown, so as not to overwhelm the map. Purple areas = 'Quarters', orange areas = 'Villages', blue areas = 'everything else'. The commonest form of rebranding is to dub the area a 'quarter'. Most things in life have four quarters. Not London. We have 21, mapped above in purple. Many are new developments seeking an independent identity from the surrounding area. 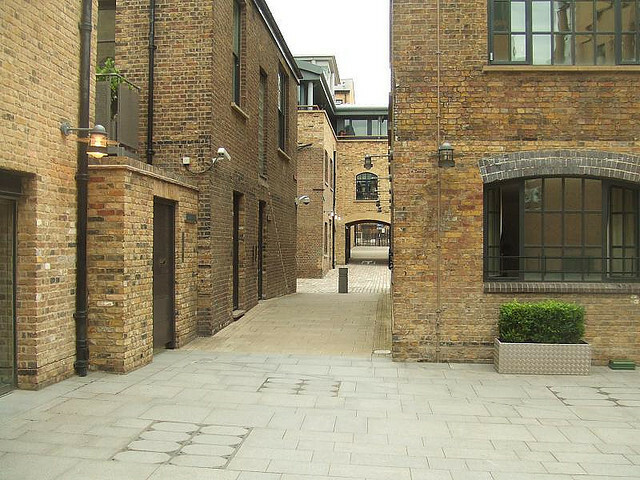 The transmutation of the old Young's brewery in Wandsworth into modern apartments is known as the Ram Quarter. A new arrangement of flats at the tip of the Isle of Dogs is termed the Parkside Quarter. The Queensbridge Quarter might make investors salivate more than plain old Haggerston. Other Quarters are conjured up by BIDs, business groups seeking to unite and promote local commerce under one umbrella. Examples include the sizeable Waterloo Quarter, and the linear Baker Street Quarter. The Regent Quarter near King's Cross was one of the earliest and most successful 'Quarter' rebrandings (despite the desolation pictured here at a weekend). The rejuvenated commercial buildings include such tenants as the Camino restaurant. Image by M@. A final category sees areas of town redubbed for cultural reasons. The largest is London's Artist Quarter, which effectively encapsulates the whole East End (and is therefore not shown on the map). This exists to support and promote the arts community in east London. More recently, the Knowledge Quarter was created to do something similar for intellectual organisations in north-central London. With its origins in the British Library, the Knowledge Quarter includes such powerhouses as UCL, the British Museum, Wellcome Trust, The Guardian, Central St Martin's, the Francis Crick Institute and Google, all of which have (or will have) a presence within a short walk of King's Cross. Another popular strategy is to conjure up a sense of community by rededicating an area as a village (shown in orange on the map). A notable example is Tony Blair's 'hood of Connaught Village, a classy quadrilateral based around Connaught Street and Square. This itself nests within the wider area of Tyburnia, a name popular in the early 19th century now resurrected to give a melliferous label to the roads south of Paddington. On the other side of Edgware Road you'll find Portman Village, part of the Portman Estate particularly replete with restaurants, bars and exclusive shops who all benefit from being promoted collectively. North of Camden Town, the lower slopes of Haverstock Hill have been redubbed Steele's Village (the apostrophe comes and goes). The renaming makes some kind of sense, as the area is not quite Chalk Farm, nor yet Belsize Park, but somewhere in-between. 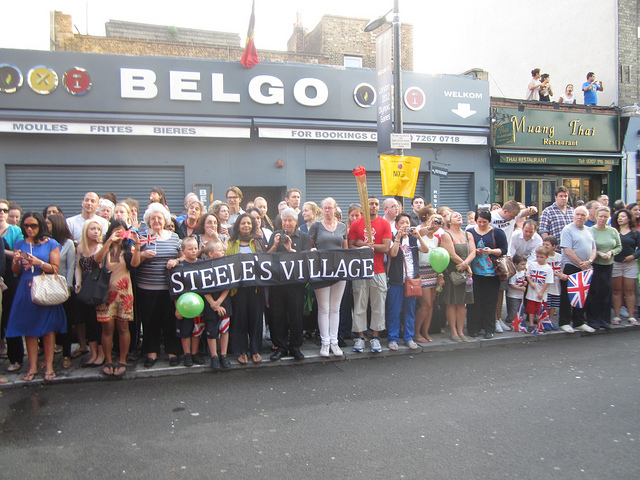 Steele's Village, named after local notable Richard Steele and his splendid namesake pub, is unusual in that its origins lie within the community rather than a top-down imposition from a business or property group. They've even got the name onto the local bus stop. These folk love their rebrand so much, they even took it to the Olympic torch relay, just down the hill. Image by M@. What used to be known as 'Stratford Marsh', or 'the Lower Lea Valley', or 'where on Earth? ', now enjoys a most august appellation. 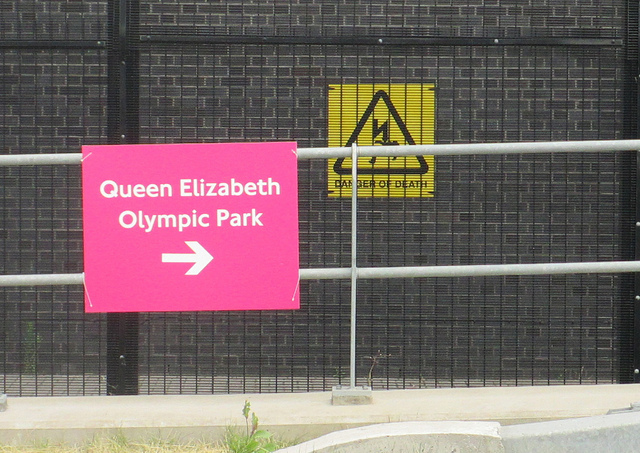 Since the close of the London 2012 games, the land has been known as the Queen Elizabeth Olympic Park, one of the biggest rebrandings in London's history. The vast area is further subdivided into smaller development zones, whose names were mostly chosen by public competition. The first to be built was East Village (itself a renaming from the Athletes' Village of the games), and Chobham Manor is next. These will be joined by further residential areas known as Sweetwater, Eastwick (including iCity, which has already been rebranded Here East) and Pudding Mill. The recently revealed Olympicopolis zone clumsily recapitulates the old idea of 'Albertopolis', a sector for learning and culture within the park. Two 'International Quarters' are earmarked as future commercial zones, and these also form part of an acreage known as Stratford City. It's all very confusing, but we're sure it'll all be settled down in 20 years. Regeneration has its dangers. Image by M@. We've barely scratched the surface. The blue bits on the map show all the other name changes (or would-be name changes). The Candy Brothers once suggested by implication that Fitzrovia should be called NoHo as a Manhattan-style northern playmate for Soho (even though the 'So' in Soho has nothing to do with being south). We still hear it occasionally uttered, but normally in an ironic way. See also SoSho for South Shoreditch; SoBo for south of Borough; and the ultimate NoGo representing North of Goldhawk Road. 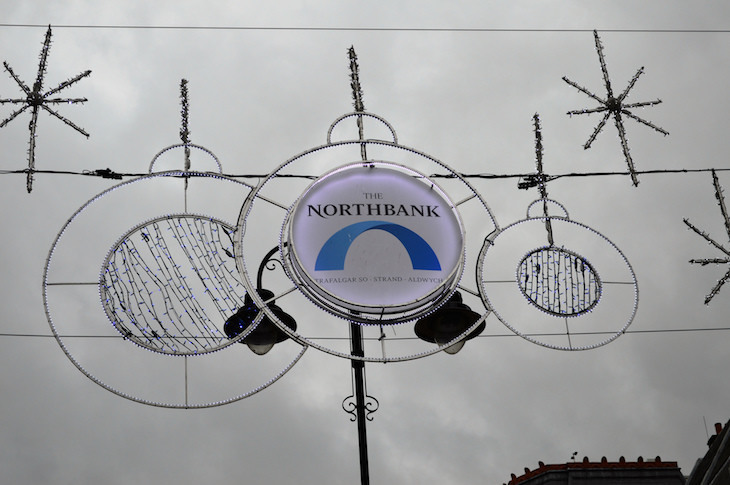 Northbank's an interesting one. This recent coinage, also the name of the local BID, incorporates the riverside streets between Trafalgar Square and the far side of Aldwych, promoting them for culture and commerce. The idea's attracted plenty of derision, but is it really so different from the creation of the South Bank as an identity? One of the area's key organisations, King's College London, almost rebranded as King's London in 2015, before thinking better of the idea. The regeneration of former council housing has led to much discussion and argument about gentrification. One side effect is the preponderance of new names on the landscape, as developers seek to disassociate their creations from what some would see as a jaded past. The now demolished Heygate Estate has risen from the rubble in a development trumpeted as Elephant Park. The nearby Aylesbury Estate is also likely to get a new name; we know not what. Over near Blackheath, the 1960s Ferrier Estate has transformed into Kidbrooke Village (including a section called Blackheath Quarter). And the defunct Wornington Green Estate in North Kensington should now be referred to as Portobello Square, perhaps the ultimate triumph of nominative gentrification. 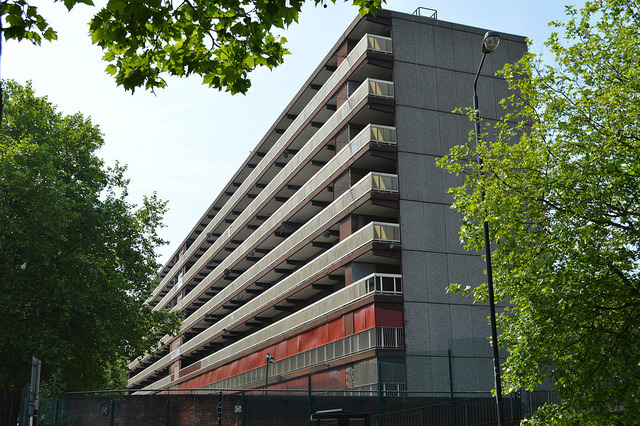 Farewell Heygate Estate... Hello Elephant Park. Image by M@. Our map, we suspect, has many omissions. Please remind us of any further examples in the comments below. Note, to give this a sensible cut-off point, we're only mapping names suggested after the year 2000. We've also avoided Estate Agent lingo like 'Blackheath Borders' (Lewisham) and 'Archgate' (Archway), as there are simply too many possibilities. See also: A previous discussion about area rebranding.